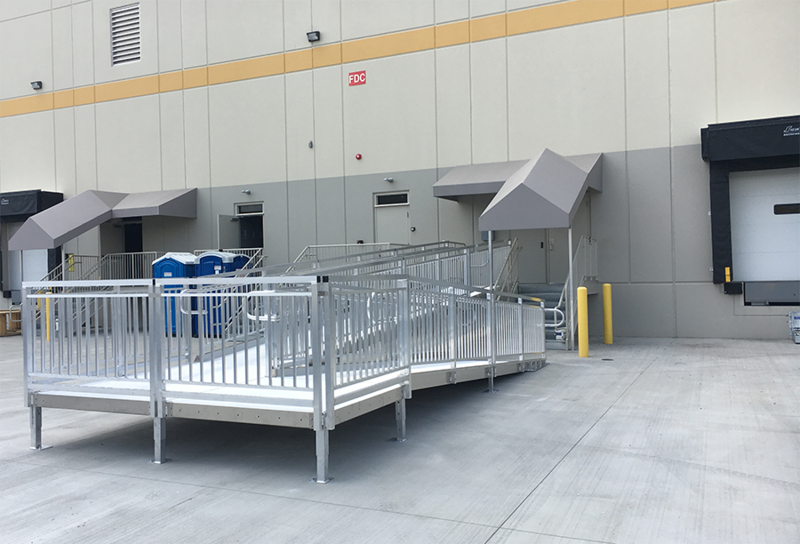 We manufacture industrial loading dock stairs for warehouses and distribution centers that will never rust, warp, or rot. Our products are always compliant so that employees can safely enter and exit the loading dock area. 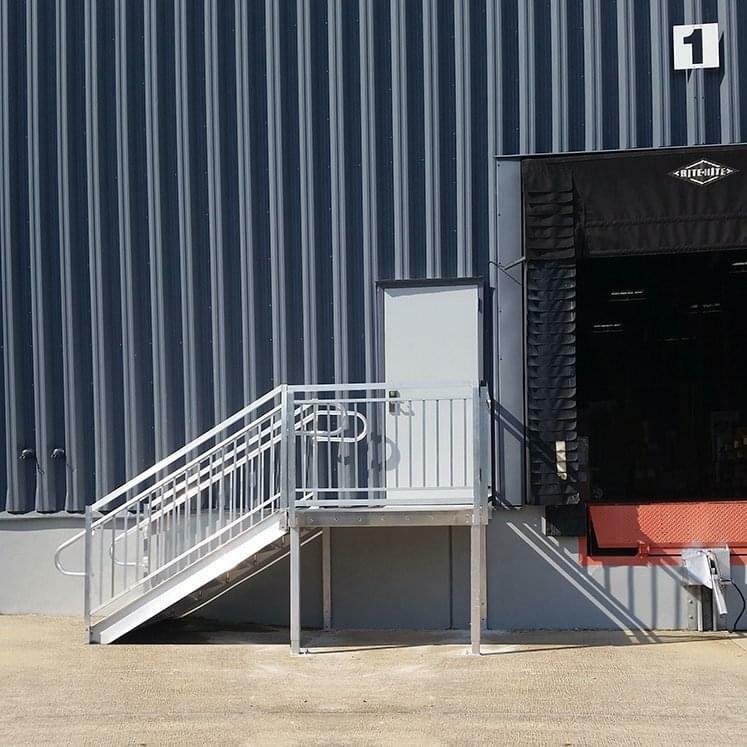 Our loading dock stairs will never rust, warp, or rot which means they are low-maintenance and have a long product lifecycle. Withstands 100 pounds per square foot live load and 300 pounds over a square foot area. There are four styles of treads which include extruded decking (standard), grip strut decking, bar grating, and fiber grate. 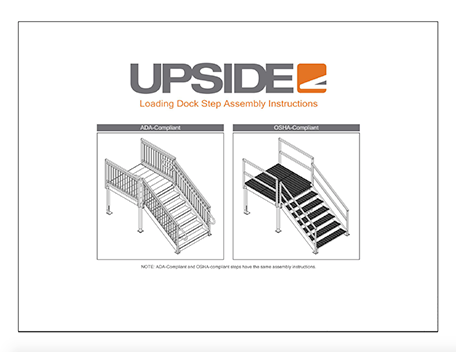 Upside’s prefabricated metal loading dock stairs require very little installation time. One set of steps and platform typically takes about an hour to install. 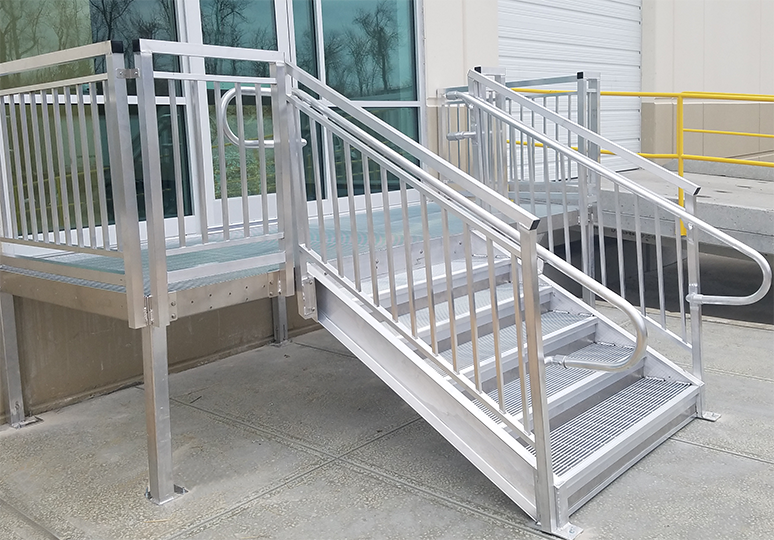 Our metal stairs are completely customizable, so you can have the exact style and configuration to match your site. View the options below. We offer a variety of color options to meet the architect’s specifications. 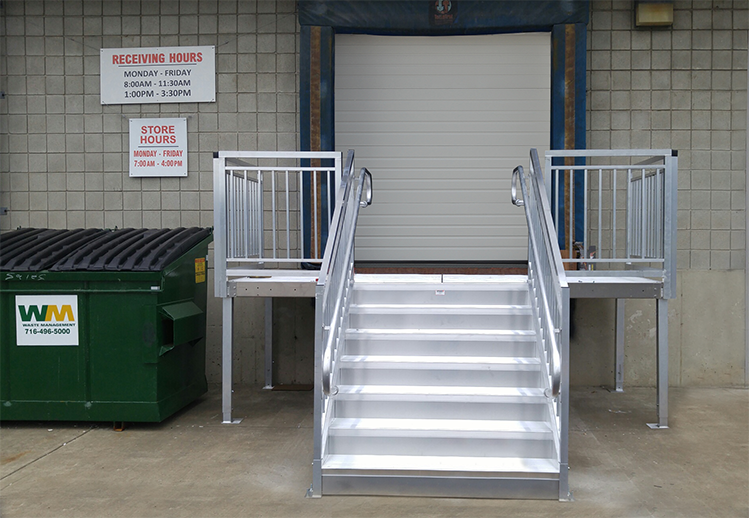 Our metal loading dock stairs are completely customizable, so you can have the exact style and configuration to match your site. View the options below. 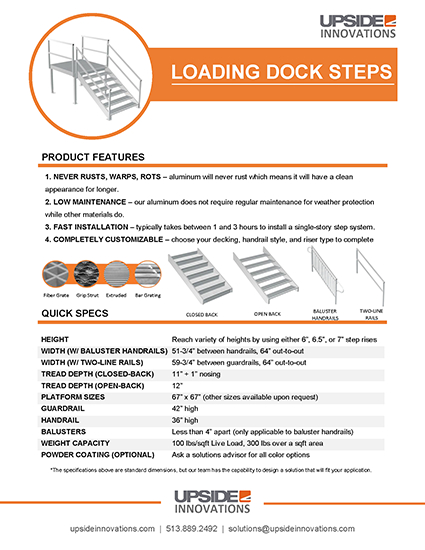 Mix and match the options below to configure a set of loading dock stairs that meets your needs. *Note: Grip strut and Fibergrate cannot be used with closed risers. Solid, knurled decking with raised ridges for ADA compliance. Parallel metal bars with ridged edges for traction. Fiberglass reinforced plastic grid with 1.5″ x 1.5″ drainage holes. Serrated surface that provides maximum traction. ADA-compliant rails with balusters for maximum fall protection. 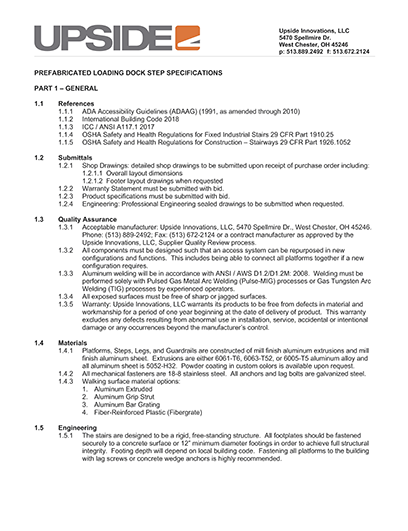 OSHA-compliant handrail and midrail made from square tube. ADA, closed-back risers have a vertical plate at the back of the step tread for added safety. 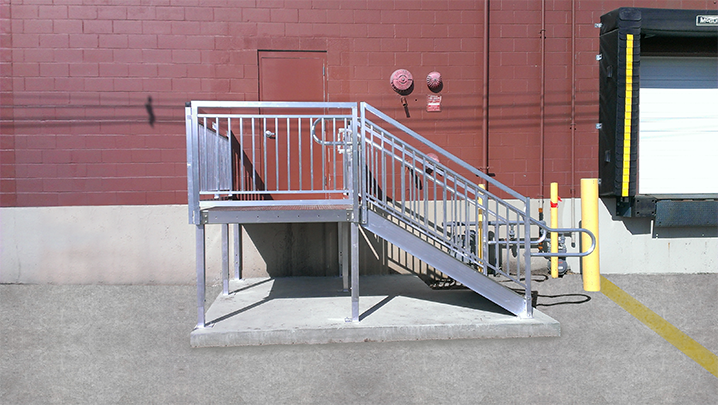 OSHA-compliant, open-back risers give employees safe access in and out of loading docks. 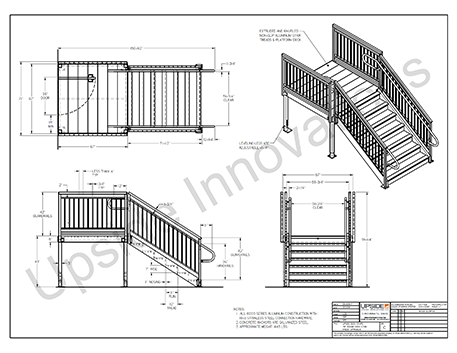 ADA-compliant rails with guardrails and vertical balusters for maximum fall protection. ADA-compliant, closed-back risers have a vertical, aluminum plate at the back of the step tread for added safety. 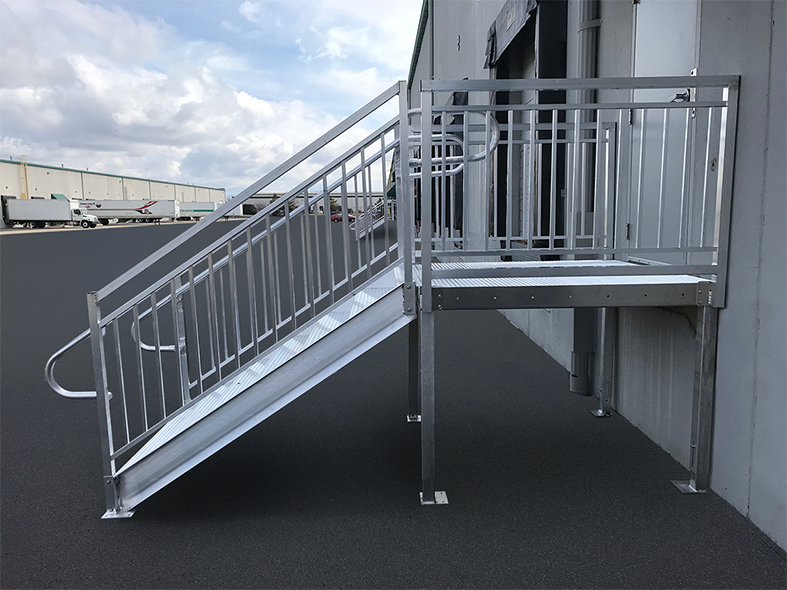 Our team designs, manufactures, ships, and installs prefabricated, durable loading dock stairs to fit YOUR custom project. We work with you, from start to finish on your toughest layouts, making sure our access solutions are customized to reach the correct height and exact configuration.